Anyway, though I could ramble on about other mystery writers I’ve tried and liked or not liked recently (Denise Mina–liked! Inger Ash Wolf–not liked! 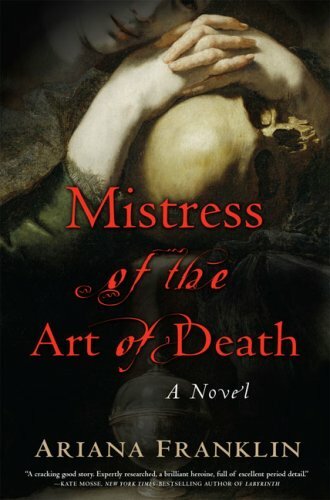 ), this post is supposed to be about Mistress of the Art of Death…which I liked. And then didn’t like. And then liked again. I have a personal distaste for crime novels focusing on murdered children: I find it troubling to treat such grim possibilities as entertainment. So I had some difficulties initially with the set up of the crimes, which seemed sensationalistic, even manipulative. This distaste receded for much of the novel as I saw how stylishly Franklin proceeded with her historical context as well as with establishing her main characters and relationships. I’m no kind of expert on the 12th century, but in the Q&A at the end Franklin discusses her research as well as her (very endearing) nerdish enthusiasm for the many period details she mastered to write the book. I have to take her expertise on trust, but I can say that she made it all seem very convincing, and in general she dealt with it very naturally, not weighing down her narrative unduly with exposition and certainly not falling into any of the annoying faux Olde-Englishe stuff that makes a lot of historical fiction seem so artificial. She’s frank, in fact, about introducing anachronisms (including calling Cambridge ‘Cambridge’ instead of its medieval names) to make the story ‘comprehensible,’ and her dialogue especially is for the most part briskly contemporary. She succeeds in making her chosen historical moment seem fraught with interesting tensions and possibilities, especially because of the religious and racial tensions that she uses effectively to frame the killings. And Adelia is a good character: smart, prickly, intense. But…with all that going for it, I wish the crime had not turned out to be a medieval version of a fairly conventional psycho-killer plot: I thought towards the end it collapsed into lurid melodrama, turning away from a compelling forensic investigation into a violent thriller in which the suspense comes not from wondering our way through clues and personalities but from waiting for the villain to take off his mask (literally!). And the revelation is a surprise, yes–but not one that particularly satisfies any story arc we’ve been following. With so much going right in the book to that point, I was surprised that it got so cheap so fast. Then there’s the romance subplot, which I found the least convincing aspect of the novel. But…just when I thought I had the measure of the book–good start, bad finish–she brought in Henry II and made everything interesting again. So I’ll definitely search out the next one in the series. Next up, though, is Henning Mankell’s Faceless Killers–long a front-runner to replace Ian Rankin’s Knots and Crosses as my example of the ‘grim contemporary’ police procedural in my class (not because I don’t like the Rankin, but because I would like a change, and also because the ‘internationalization’ of the crime novel in English seems to me the biggest recent development in the genre). I’ve tried Mankell before and gotten stumped by the bleakness of the atmosphere and what seemed a flatness in the style (or the translation). February seems the right month to try again, doesn’t it? I mean, who expects anything cheering in February? What’s this business of YOU seeking out the next “Mistress of the Arts of Death” novel? Have I been … gulp …. fired? I think you’ve put your finger on why the subsequent novels in this series haven’t worked for me. Having created a character in Adelia who is fighting to show that women can do the work normally prescribed for men it’s a shame that later novels only really catch fire when Rowley and particularly Henry come onto the scene and in the second novel in particular, this happens very rarely. And, I have yet to forgive her for the way in which she ended the fourth one (‘The Assassin’s Prayer’ in the UK although I think they have different titles in the US). I won’t drop a spoiler in here but let’s just say she leaves a major storyline open as a hook to pull the reader into number five. She’s turned the series into soap opera. I get very stern and disapproving about novels that seek to manipulate their readers shamelessly by using dead or threatened children. Apart from anything else, there are way too many of them around at present (I’m sure the idea sells well to sensation-hungry publishers). So I can quite see why that and the slasher ending put you off a bit. I read Faceless Killers expecting to loathe it (I was reading it for a review programme – I don’t normally approach books that way!) and in actual fact was rather impressed. It is gory at first, and bleak, but I found a Beckettian humour poking through, and the character of Wallander is very well done. I’ll be most interested to hear how it strikes you. @Steve: no, definitely not! But I do sometimes still go to the library–or even a bookstore!–on my own. Just a habit! @Annie: interesting. I actually thought it might be better in the next book if Rowley wasn’t around as much. The tension she initiates in this first one between Adelia’s vocation as a doctor and her romantic feelings seemed promising but she resolved them in what I felt was a conventional and kind of wishful way. I hate cliffhanger endings in books that are clearly meant to market the next one! Harumph. @litlove, yes me too. Elizabeth George’s latest one (or was it one back?) did that too. I think if you choose that kind of story you ought to take special care not to sensationalize the details. I’m faring better with Faceless Killers this time than last time I tried it. I’ll be glad to happen across some humour somewhere in it. Still, I think I’ll be glad to turn to Rosy Thornton’s Tapestry of Love for some gentle relief (it’s on its way from the Book Depository, as kind of an antidote to February!). I’ve just heard that we Diana Norman, alias Ariana Franklin has died today and so we won’t get to find out how the cliffhanger was resolved. I feel a rat for being mean. I am so sad to hear she passed away, and so disappointed to not be able to read anymore of the series and find out what she had planned for Adelia.